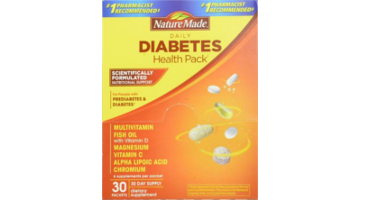 The Nature Made Diabetes Health Pack is scientifically formulated to supply nutritional support for people with diabetes or prediabetes, and provides essential nutrients that may be lacking due to the strain diabetes can often put on the body's health. If you have diabetes or prediabetes and are not always eating a balanced diet, Nature Made Diabetes Health Pack helps to provide the nutrients that you may be low in. Each pack provides a comprehensive combination of key vitamins, minerals, fish oil, and alpha lipoic acid. These packets contain Magesium and Fish Oil supplements. Consult a physician before use, if you have kidney disease, are pregnant or nursing, taking medication, facing surgery, have bleeding problems, or undergoing any other treatment which may affect the ability of blood to clot.